The first graves were placed in Pioneer boot hill cemetery in 1863 for both plots, when the town experienced a massive population boom after gold was discovered in the nearby Boise basin. 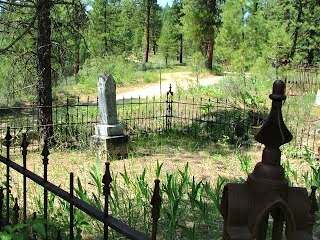 The Cemetery expanded steadily over the years as the gold rush in the town attracted more and more people, as several thousand flocked to the area to open businesses and provide services. The town saw around 250 businesses at its peak and due to the nature of the area, and with all its prospectors and the travelers death were certainly not uncommon. After the main gold rush had ended a huge fire set about the town and destroyed about 80% of all buildings, which were rebuilt by the remaining wealthier residents in the town. The cemetery still sits in its original location and operates as such to this day. It can be found in Idaho city in the north east area of town. One thing i always love about these gold rush towns is the gritty gun slinging, bawdy house style atmosphere you can imagine existing here. The town saw a great many people die within the area from a number of reasons, from gun fights in the street to house fires to mining accidents to disease. The cemetery currently holds 200 head stones, though there are though to be around 2000 graves across the whole cemetery grounds. Of the first 200 graves which were placed in the cemetery only 28 of those were from natural causes, and it seems all of this turmoil is the foundation for the cemetery's hauntings. As for the hauntings here there are only 3 reports which seem to have been witnessed more than once. The first is of a young girl who has been seen standing next to a number of Chinese graves, she has been seen as a misty figure of a small girl who just stands and stares at the head stones before disappearing after a few seconds. The next one is the appearance of unexplainable mists, the type which either only show up on photos and cant be seen by the naked eye. Appearing as thick mist in a thin curving or spiraling line shape. The third is the apparition of an old man, thought to be a prospector who died in the area. He has been seen dressed in old western gear, with a short beard and vest-jacket. The nearby area is also the scene of a number of ghostly encounters, with the old grocery store and the towns oldest saloon being the main sites of these hauntings.